We had the winter off from agility as our club is ran outdoors. We have had tremendous fun introducing Maggie into agility. Now that she is a year old she is at the right age developmentally to do agility. This pup flies. just need to work at fine tuning! She is not nervous at all. Totally loves the seesaw and walkway! GO MAGGIE! Melvin is still enjoying agility. He loves jumping he will always be a tigger retriever on invisible springs. We have been going each week to the agility group. This week we took Melvin and Molly. We have made great progress with Molly, last week she needed reassurance all the time. This week providing I am quicker with her, she does get on with it better, though it is me who needs to learn how to be on the right side of the jumps for the course, so a positive step forward for Molly! Molly is not keen on the tunnel though so this is something we will need to practise with her. 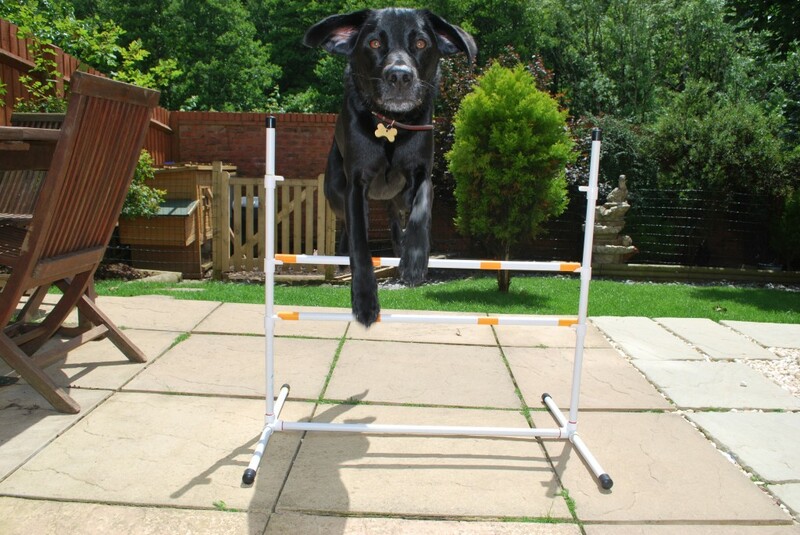 Melvin is getting on really well with his agility training. Stanley is also enjoying doing some agility training. We joined an agility group which turned out to not have the right approach for us. They liked to tell us we were getting it wrong rather than teaching us how to get it right so it wasn’t fun at all. So we have found ourselves a new agility group, we have been going every week now and the dogs are having a hoolie! As if they wouldn’t have loved it! We now have a tunnel, a set of weaves and the lollipop jump for them to practise! We have bought them special collars that are safer to use during the agility course training. Melvin and Stanley have been several times, last week we took Molly for the first time and although she was a little unsure she completed the course relatively easily! Katherine has been enjoying running Melvin and Stanley on some agility courses. So we hope to join an agility group to see how we get on! Here is a video clip of Katherine and Stanley having fun. They came first in their age group! WELL DONE Katherine and Stanley! Im very proud of you both. I have started a new game with the woofs, having purchased my first proper dog jump two days ago,we have had four short training sessions. Charlie, bless his little socks is the sort of dog who will be quite happy to be a spectator but get rewarded for his efforts! Archie is not a huge amount better as although he can jump over the bar he does prefer to try to walk through it or around it! Molly obviously can do the jump. no question there. Molly is a princess though and isnt keen on dirtying her little claws for something that does appear a little pointless! Stanley is the unexpected surprise – HE LOVES the jump! 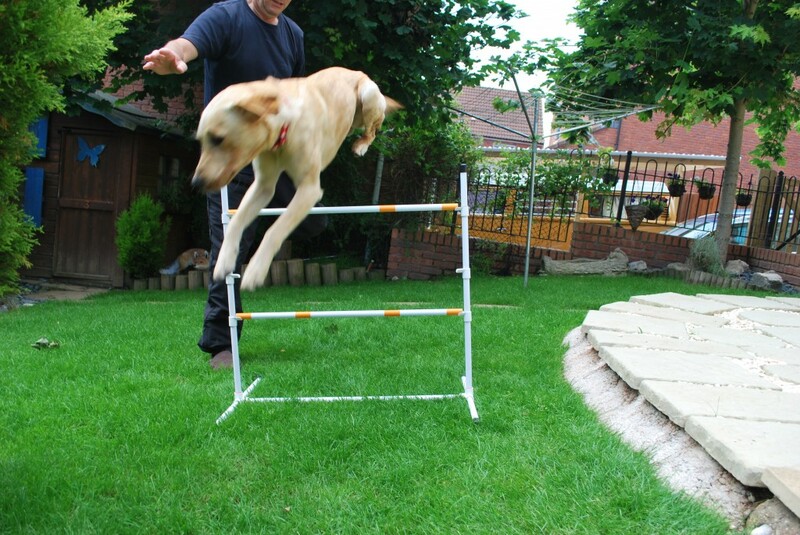 I have high hopes for teaching Stanley more agility skills….. however…at this time we have only ONE jump so until I purchase something else he will have to make do. We will try and raise the bar so Stanley has a higher setting to clear! Melvin was the reason I bought the jump as he is my tiggeretriever with invisible springs! Melvin goes MAD for the jump! I think Melvin would do well at a higher jump as he clears our back gate with relative ease (six foot!). Katherine has spent time with all of the dogs teaching them to go over the agility jump. Using an encouraging voice and their favourite toy gives great results. Well done Katherine for your efforts!